The Pope underscored the deeper message of his ted talk a few days later, on a trip to Egypt. There he joined in the pain of the country’s Coptic Christians, who have been reeling from a pair of isis-inspired bombings that killed forty-five worshippers on Palm Sunday and maimed dozens of others. 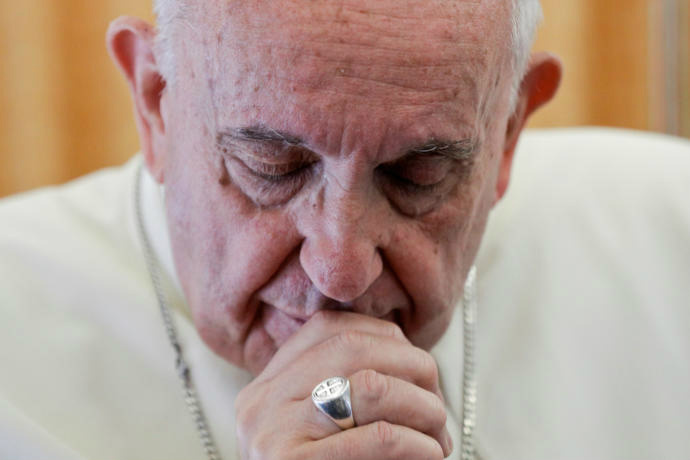 “Your sufferings are also our sufferings,” Francis said, referring not only to the recent attacks but also to the sect’s long history of assault and discrimination. With Pope Tawadros II, his Coptic counterpart, Francis engaged in what he called an “ecumenism of blood,” even issuing a surprise joint declaration whereby the two churches, alienated for a millennium and a half, recognized each other’s baptisms. Across an ancient boundary, Francis was a Christian standing with beleaguered fellow-Christians. On the same trip, the Pope crossed another, more pointedly symbolic boundary. His journey retraced the mythic pilgrimage of his namesake, St. Francis, who travelled to Egypt, in 1219, in a futile attempt to end the Crusades. The saint may have imagined converting the local sultan, but what he mostly sought was a détente between Islam and Christianity. That religious divide persists today, of course, and still carries a Crusader legacy. In Cairo, Pope Francis met with Muslim leaders at Al-Azhar University, which was established more than a hundred years before Oxford and remains the most important religious educational institution in the Muslim world. Condemning the “barbarity” of terrorism, he invited the gathered clerics to join him in saying “once more a clear and firm ‘No!’ to every form of violence, vengeance, and hatred carried out in the name of religion or in the name of God.” Francis referred indirectly, but plainly, to Abdel Fattah El-Sisi, Egypt’s authoritarian President, saying, “History does not forgive those who preach justice but then practice injustice. History does not forgive those who talk about equality but then discard those who are different.” Sisi was not the only one to hear that rebuke; his heartened opposition did, too.